Is ‘All In With Chris Hayes’ Making MSNBC’s Prime-Time Ratings Fall Downward? When MSNBC announced in March that Ed Schultz's weeknight program, “The Ed Show,” was being replaced by “All In,” which is hosted by 34-year-old Chris Hayes, the executives of the "Lean Forward" network hoped that the new hour-long program would hold onto the channel's liberal audience and even draw in younger viewers. Instead, the ratings for Hayes' broadcasts in April were down 18 percent in total viewers from that month's numbers in 2012 for “Ed,” and it appears that “All In” is also dragging down the viewership for “The Rachel Maddow Show,” which was off by seven percent from its ratings during that period a year ago, and “The Last Word With Lawrence O'Donnell,” which also fell eight percent in a year-to-year comparison. Also, all three MSNBC prime-time programs dropped in the key 18- to 54-year-old demographic, with “All In” falling to fourth place in its time slot, “Rachel Maddow” coming in third, and “The Last Word” dropping six percent. Hayes has a much different style of programming than his counterparts. Wonky, earnest and soft-spoken, he has none of the outrage of O'Reilly -- or, for that matter, Schultz. So what went wrong with the liberals' latest “Golden Boy?” Part of the answer comes from the ratings and demographics. As always, Fox News Channel dominates the evening numbers, but some of MSNBC's problems may be the result of viewership growth on the Cable News Network. “Anderson Cooper 360” was CNN's top-rated show in both viewers and the key demographic, topping his year-ago numbers by 129 percent and 197 percent, respectively. Since both channels attract liberal viewers, some of MSNBC's audience might be migrating to the other network. 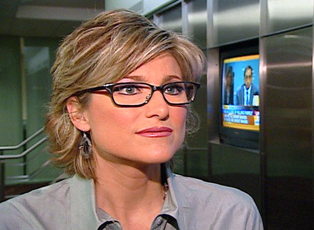 However, Hayes isn't the first liberal with big-rimmed glasses who was supposed to represent the future of TV news. Ms. Banfield, so recently promoted as one of cable news's most promising young stars, has faded into the back bench of NBC News, a sudden change that has surprised people throughout the industry. “MSNBC, desperate for attractive and vibrant personalities who connect with viewers, thought it had found one in Ms. Banfield, and then pushed her along too quickly, only to hastily abandon her when the ratings waned,” Rutenberg stated. As NewsBusters previously reported, Hayes was brought in to replace Schultz, “a champion of the working class whose bluster didn’t always pair well” with other MSNBC prime-time anchors. But right from the start, the ratings for “All In” were poor, and the program has yet to draw a respectable audience of any age group, much less the youthful demographic. However, the few remaining fans of Ed Schultz's MSNBC program -- and bluster -- will be glad to learn that, after an excessively long delay, “The Ed Show” will actually return on Saturday, May 11, at 5 p.m. The Saturday and Sunday show will debut as an hour long-program and expand to a two-hour format later this summer.